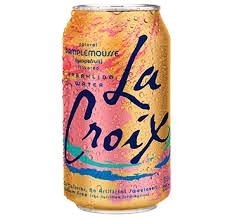 LaCroix Sparkling Water - Grapefruit "Pamplemousse"
100% Natural. Calorie-Free, Sugar-Free, Sodium-Free and NO artificial sweeteners! Flavours come from the natural essence oils extracted from the named fruit used in each flavour. Perfect balance of flavour, carbonation and crisp refreshing taste.